சவால்களை சந்திக்க தயாராகாவிட்டால் வாழ்க்கையில் சாதிக்க இயலாது. விடாமுயற்சியுடன் எந்த சவாலையும் மேற்கொண்டு வாழ்க்கையில் வெற்றி பெற இயலும். டாக்டர். விஜய கார்த்திகேயன் ஐஏஎஸ் அவர்கள் ஒரு மருத்துவராய் தனது பணியைத் தொடங்கி, இந்திய ஆட்சி பணி தேர்வில் தனது இரண்டாம் முயற்சியில் வெற்றி பெற்று, தற்போது கோயமுத்தூர் மாநகராட்சியின் ஆட்சியராய் பணியாற்றி வருகிறார். ஒரு எழுத்தாளராய் சில புத்தகங்கள் ஆங்கிலத்திலும், தமிழிலும் எழுதியுள்ளார். 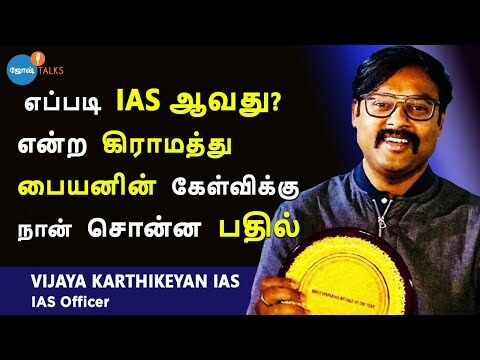 அவரது ஆங்கில புத்தகமான “Once upon an IAS Exam”, இந்திய ஆட்சி பணியில் பணிபுரிய முயற்சிக்கும் மாணவர்கள் மத்தியில் இந்திய அளவில் பெரும் வரவேற்பைப் பெற்றுள்ளது. தனது வாழ்க்கை அனுபவத்தில் ஒவ்வொரு துறையிலும் தான் சந்தித்த சவால்கள், அதனை மேற்கொள்ள எடுத்த முயற்சிகள், ஒரு ஆட்சியராக கொண்டு வந்த மாற்றங்கள் ஆகியவற்றுடன் ஒவ்வொருவரும் முழு முயற்சியுடன் எவ்வளவு பெரிய கனவையும் நிறைவேற்றி சாதிக்க முடியும் என்று கூறுகிறார். இக்காணொளியில் விஜய கார்த்திகேயன் தான் எவ்வாறு இத்தகைய நிலைக்கு உயர்ந்தார் என்றும் அனைவரும் கனவு நிறைவேற முழு முயற்சியுடன் செயல்பட்டால் எவ்வாறு வெற்றி பெறலாம் என்பதைப் பற்றியும் கூறுகிறார். Dr. K. Vijayakarthikeyan is an Indian bureaucrat, civil servant and is currently working as Director, for Tamilnadu Institute of Urban Affairs, Coimbatore in the Tamil Nadu. He also served as the Commissioner & Special Officer, Coimbatore City Municipal Corporation, Assistant Collector (Trainee) at Erode and Sub Collector at Kovilpatti before his appointment as Director for Tamilnadu Institute of Urban Affairs Coimbatore City. He is also a doctor, and cartoonist, having been regarded as the youngest Commissioner of Coimbatore Municipal Corporation. He is engaged in training and motivating youngsters for appearing in civil service examinations. He is also a writer and has authored several books in Tamil & English. He has received several national awards for his work achievements. He has received the Dr. APJ Abdul Kalam Memorial Award for Innovation in Governance (Kiga) at an event held in New Delhi. He is also well known for his book, "Once Upon an IAS Exam". His Life story is a good example of achieving bigger dreams by never giving up. He also shares his success story and the challenges he faced to achieve his dream. As a Doctor, Writer, Civil Bureaucrat he has brought in many changes and executed many creative plans for the welfare of the people. Every individual who aspires to achieve something great in life needs more effort, hard work and perseverance to make the dream come true and can also be a change maker in the society. Watch one of the best Tamil motivational videos in Josh Talks Tamil, that would inspire many people in Tamil Nadu and also the Tamil people living around the world. Tamil movies and Tamil film industry have impacted and brought in Tamil motivation through many stories but this story of an Entrepreneur not just gives the answer to change your perspective on Utilizing every opportunity for better living but also learnings that anyone can follow to believe in you and your goals. This story will help you to plan on a simple way to begin the process of possibility within you and also will help to battle your impossibilities. This Tamil motivation talk will change your Life and not just intrudes with inspiration but also will make you start executing the plans that you have made to achieve both short-term and long-time changes that you expect for a better Life in the society.